Much like cocktails and pairs of blue jeans, everyone has their go-to condiment. Maybe it's dijon mustard, or hot sauce, or, god forbid, Vegemite. Whatever yours may be, the debate can be exceedingly contentious when it comes to the best add-on sauce or French fry dipping option. But just how much do preferences vary from coast to coast? A new survey is out to help sort things out by revealing the most popular condiment in every state. 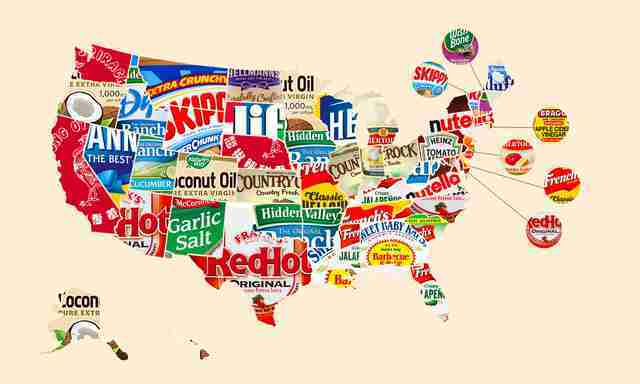 From the number crunchers at product ratings platform Influenster, this new map claims to reveal the specific condiment that is most popular in each state. Specifically, Influenster's data team went into the back end of the site and analyzed over 50,000 reviews to determine which is the "most buzzed-about" condiment in each locale by weighing the ratings and number of reviews left by members in each state. Overall, the mix was quite diverse, though a few favorites definitely stood out. Both Hidden Valley Ranch Dressing and Nature's Way Extra Virgin Coconut Oil were the most popular in five states apiece, while Frank's RedHot and Nutella came out on top for four states each. Sriracha and Sweet Baby Ray's BBQ Sauce were also popular choices, taking the the number one spot in three states each. Here's how favorites across the entire country stack up. It's tough to glean too much from the picks on here, but it seems tastes are somewhat similar in select geographic regions. For instances, the majority of the Midwest appears to prefer creamy condiments over more spicy selections, while much of the West Coast (and Texas) likes a bit more heat. There's no doubt the picks will also spark debate, especially when it comes to the specific brands of products, but it's still an interesting way of looking at how palates around the country differ. That said, it's worth noting that some wildly popular sauces seem to be glaringly absent from the map entirely (looking at you, honey mustard). 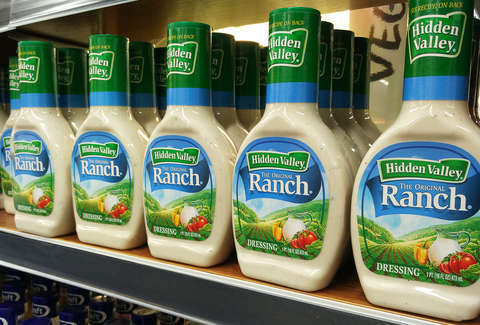 But at least Hidden Valley knows where to stock shelves with its kegs of Ranch.